Wishing on a Snowflake: Our snowflakes made it! As far as today being the big anniversary, it's been going pretty well. Last year when my mom died, we planted a beautiful maple tree in our backyard in memory of her. Before she died, I told her we planned to do this and asked that she "meet" me there whenever I needed her. She of course agreed. The tree is still small but appears to be growing and has beautiful orange and red leaves all over the top. 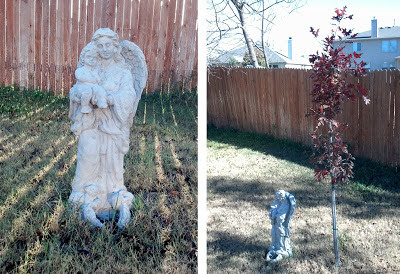 When we were at the nursery buying the tree, I came across a garden statue of an angel holding a baby. Since we live in Texas and my mom was buried in Utah, I knew this statue belonged under her special tree as a memorial I could visit since I wasn't near her grave. This morning, I went out and spent some time talking to her and letting her know I think about her every single day. I know I keep saying it, but I'm positive she is near and can hear me. She's cheering us on throughout our journey, I can feel it in my soul. I'm positive she's with you, too! That really is a wonderful idea about the tree. What a great memorial to your Mom! Also, I am so hopeful and happy for you that your embryos are all cold and snuggly there in Texas for you! 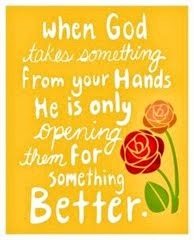 I SO want this for you, and have everything crossed! !